Traveling in a car en route to his next meeting with voters in India, Sam Pitroda, Chicago-based telecommunications entrepreneur and former advisor to India’s Prime Minister, shares his concerns about the heated election environment. The tenor of political conversation in the largest democratic elections in the world where voting starts April 11, and some 900 million people can cast their ballot is, predictably, a source of anxiety and excitement on all sides of the political spectrum, and on this side of the globe. “In the last three days alone we have been holding more than 16 ‘Chai Pe Charchas’ and ‘Chowkidar’ marches around the United States,” Krishna Reddy Anugula, president of the Overseas Friends of BJP, tells News India Times. 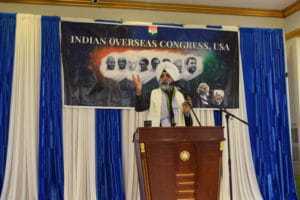 He also points to the organization Sikhs of America, which held a car rally in support of Modi in Maryland on March 31. Members of Sikhs of America had not returned calls by press time. The heated environment in India where nationalist and patriotic sentiments have taken the fore with the recent suicide bombing in Pulwama which took 50 lives, and secular values also proclaiming their patriotism, have been mirrored within the expatriate community living in the U.S.
As India is engaged in the always high octane election battle — this time to bring back Prime Minister Narendra Modi, or replace him with Congress Party dynastic leader Rahul Gandhi, non-resident Indians (NRIs) in the U.S., and Indian-Americans who have families and friends in India, are energized to act. “People are volunteering to go on their own to India. Hundreds have left already, and some are going this week and probably a few hundred more ill join them in India,” said OFBJP’s Anugula about this party’s supporters in America. “They are going to campaign in their own villages and towns, and districts,” Anugula said. “I’m going to be here for some time,” Pitroda said. “It has been very hectic.” He says the media is “a little one-sided” and “messages are twisted” and economic development is taking a back seat. “Here (India) you have the Pakistan border and Muslims that have been made out as issues and not development,” Pitroda contends drawing a parallel with President Trump’s focus on the “border wall” and immigration. Even if the Indians here are U.S. citizens, Anugula says, they get involved by calling their family members and friends. “They are excited and want to drum up support for Modi. They are more excited in these elections because they have seen India’s stature grow with Modi. And the alternative is not good. It will bring instability and no growth,” Anugula predicts, if Modi loses. “We are interested in the Indian elections because we all have family back home. 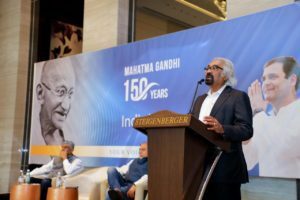 We’ve done well, we want our families to do and be well,” said Pitroda who remains an Indian citizen, living in the U.S. as a permanent resident. That explains the interest of Indian-Americans as well, according to him. Next on Pitroda’s schedule is an appearance alongside Congress Party leader Rahul Gandhi in a rally addressing thousands of students, in Pune, April 5, he says, followed by a meeting with the business community in Mumbai, and so on. Meanwhile, back here in the U.S., Modi supporters have been trying to enthuse people (see story – “Ham Bhi Chowkidar”), urging them to travel to India, and work the phones from here. At a March 31, meeting in Paramus, N.J., Indian-Americans for Modi met to ratchet up the campaign with emotional appeals. “We must give our support to him (Modi) otherwise Bharat Mata will not forgive us,” said Narsinh Desai, the main organizer of the event. “We must use this opportunity … I have request that we send thousand people to India. … We cannot sit idle,” Desai added (rough translation). “We are fully involved. We want to help our country, our motherland,” said Mahinder Singh Gilzian, president of the Overseas Indian Congress to News India Times. Gilzian’s level of engagement goes deeper. He has submitted his name for consideration as a candidate for the Anandpur Sahib seat. “I am not sure I will get it. But if not this time, then next time,” Gilzian adds philosophically. He has a construction company and is from Mineola, N.Y. His brother Sangat Singh Gilzian, he says, is a three-time Member of the Legislative Assembly (MLA). Gilzian has been an active campaigner for the last 20 years, he said, including in state elections in India. Last time he was in Mizoram he recalls. He notes that NRIs in the U.S. who support all the parties are active here, as are state parties like Akali Dal, or Dravida Munetra We Kazagam (DMK) from Tamil Nadu. “People want to help their own parties,” he notes. Devender Nallamada, the media spokesman for the Telangana Rashtriya Samithi USA, told News India Times, at least 10 people had left for India already to campaign with candidates in their constituencies Telangana. “We help in whichever way we can, in India and here. We participated in the local MLA elections as well in India. And here we speak to people about what the TRS is doing and its successes. We also participate in debates on TV here, with other parties to raise awareness,” Nallamada said. “Our people (Congress Party supporters) are from so many states in India, and everybody knows their politicians, and they have their families back home. So through social media and in other ways, they are contacting,” Gilzian said. He expects the biggest contingent to head to India will be in the second week of April as the voting starts on 11th and carries on for a month. Most will stay for about two weeks, he estimates.